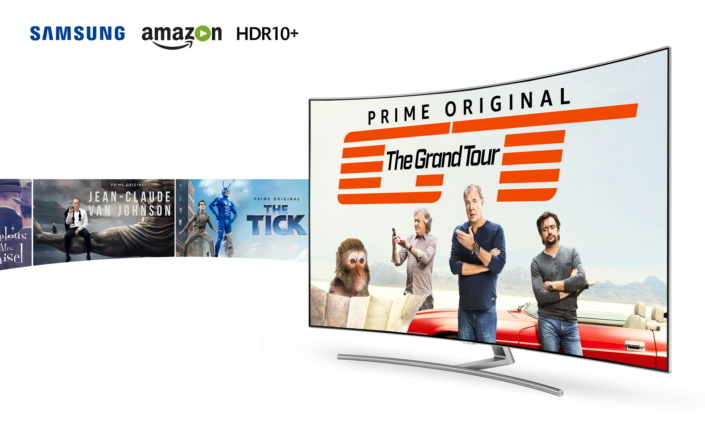 Samsung Electronics and Amazon Prime Video today announced the entire Prime Video HDR library is now available in HDR10+, a new open standard that leverages dynamic metadata to produce enhanced contrast and colors on an expanded range of televisions. The Prime Video HDR10+ catalogue includes hundreds of hours of content such as Prime Originals The Grand Tour, The Marvelous Mrs. Maisel, Jean-Claude Van Johnson, The Tick and The Man in the High Castle plus hundreds of licensed titles. Prime Video is the first streaming service provider to deliver HDR10+ content to its users. HDR10+ is available on the entire Samsung 2017 UHD TV lineup – including the premium QLED TV models. The HDR10+ technology on Prime Video incorporates dynamic metadata that allows high dynamic range (HDR) TVs to adjust brightness levels on a scene-by-scene or even frame-by-frame basis. By applying individualized tone mapping to each scene, HDR10+ delivers an incredible viewing experience for next generation Samsung displays. The picture quality offers an enhanced visual experience with more detailed expressions, brighter shadow areas and more accurate color renderings that stay true to the creator’s original intent. Through the utilization of the precise “Bezier” based tone-mapping guides, Amazon is able to deliver the optimal viewing experience across a variety of TV models. Amazon Video is a premium on-demand entertainment service that offers customers the greatest choice in what to watch, and how to watch it. Prime Video offers thousands of movies and TV shows, including popular licensed content plus critically-acclaimed and award-winning Prime Originals and Amazon Original Movies from Amazon Studios like The Tick, the most-watched Prime Video series worldwide The Grand Tour from Jeremy Clarkson, Richard Hammond and James May, and award-winning series like The Man in the High Castle, Mozart in the Jungle and more available for unlimited streaming as part of an Amazon Prime membership. Prime Video is also now available to customers in more than 200 countries and territories around the globe at www.primevideo.com.